Peter Hook recently released concert recordings of four different New Order and Joy Division albums, but if the live experience is more your thing you’re in luck. Next Spring, he and The Light will return to North America to play New Order and Joy Division’s respective Substance albums, a reprise of the tour he launched late last year. The leg kicks off in Philadelphia in April of 2018. Both released in the late ’80s, the Substance albums are both compilations comprising some of each band’s best songs, including Joy Division’s “Love Will Tear Us Apart” and New Order’s “Ceremony”. The albums will be played sequentially and in their entireties. 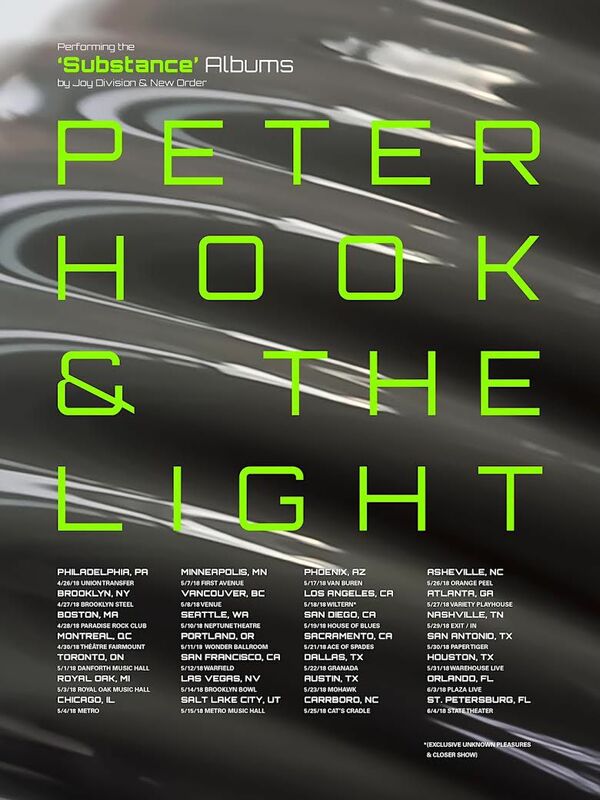 Hook also announced that it would be playing a standalone performance of Joy Division’s Unknown Pleasures and Closer on May 18th in Los Angeles. The date marks the 38th anniversary of the suicide of the band’s Ian Curtis. See the full tour itinerary — which also includes dates across the UK, Europe, and Australia — below.